Regional Information Center "CARPATHIANS" » PRYBORZHAVSKE OUTCROP. 48°’ 20′ 29″ N lat. ; 23’15’ 05″ E long. In the left bank of Borzhava River at south-eastern outskirt of Pryborzhavske village there is located closed quarry. Inside there are discovered Upper Jurassic-Lower Cretaceous pink, bright-grey and cream-colored marbled limestones. They are cut by dense network of randomly oriented tectonic breaks and fractures filled with calcite veinlets. Tectonic breccias often occur where pink limestone clasts are cemented by white caleite matter. Along the faults occur sliding mirrors, extensive cataclasis (up to milonitization), iron mineralization, and sometimes found pyrite concretions. 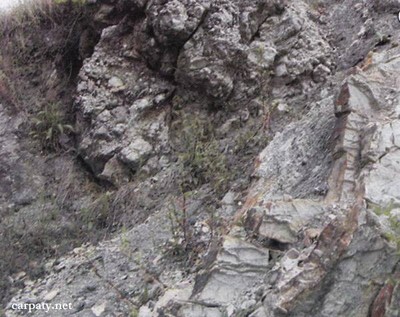 Within limestones occur tectonic wedges composed of platy grey limestones with siliceous concretions that are intercalated with calcareous argillites. In carbonate rocks there are known numerous finding of organic remnants — ammonites, belemnites, hastropodes, pelecipodes, and marine lilies. 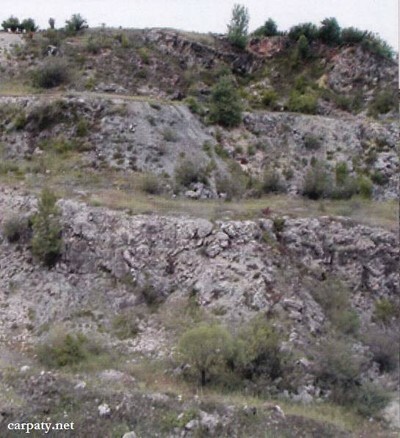 Extensive tectonic breaking which occurs there in conditions of excellent exposure is related to Penninian sub-zone of Trans-Carpathian deep-seated fault and is characteristic for long-lived deep-seated mobile zones. This place is being visited by members of various geological trips, students-geologists, and tourists. Ecological conditions are suitable. Accessible by motor-car.